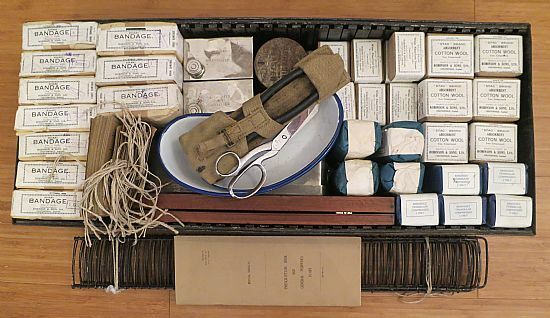 The Field Surgical Pannier 1 & 2. 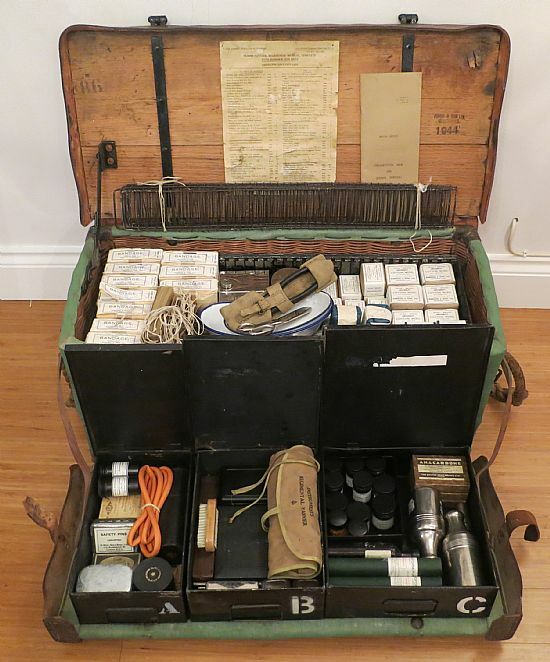 The Reserve Field Medical Pannier. The Field Dental Outfit Pannier 1, 2 & 3. 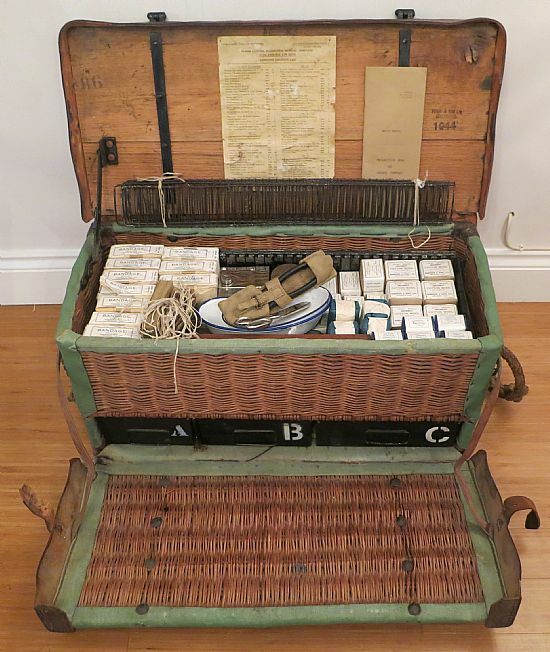 Above: The 1941 Pattern, Regimental Medical Pannier. Above: Photo to show the side of the pannier. 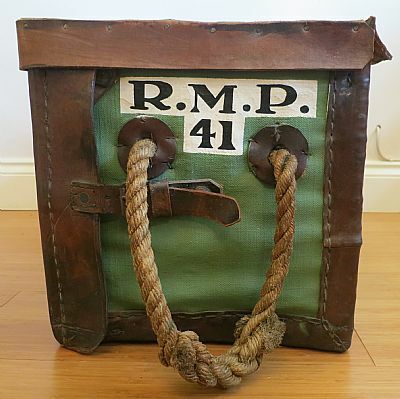 "R.M.P 41" stands for "Regimental Medical Pannier, 1941 Pattern". 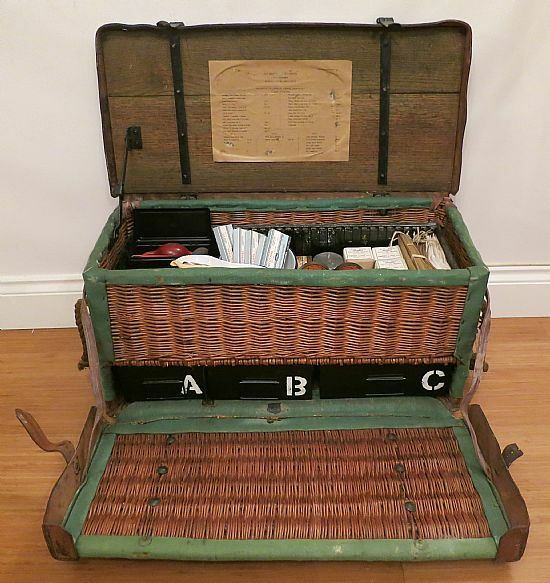 Above: The Pannier with lid and front opened, showing the location of the lower tins (A,B,C). Above: Regt. 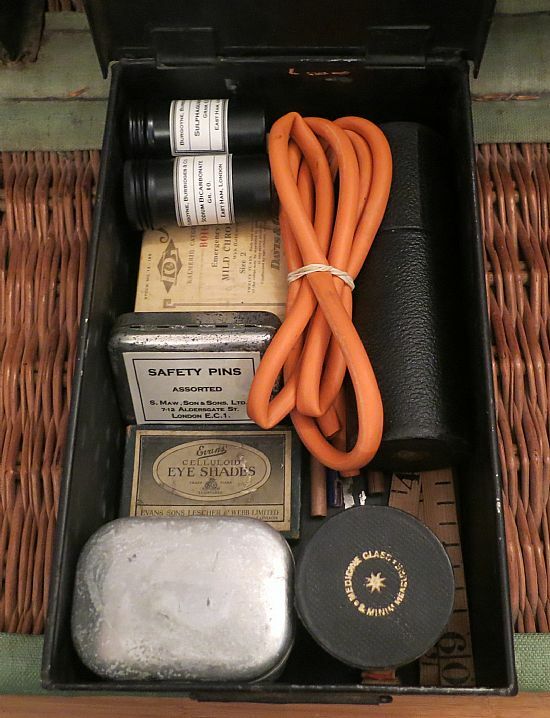 Medical Pannier contents list and locations. Bandage, LW (Loose Woven), khaki, compressed, 3in. x 4 yd, each 120. Bandage, Triangular, khaki, compressed; 2s. pkg 10. Basin, Dressing, E.I., K.S. (Enameled Iron Kidney Shaped) 8 in. each 1. Basin, Dressing, E.I., K.S. (Enameled Iron Kidney Shaped) 10 in. each 1. Card, Field Medical, No. 100. Card, Field Medical, Envelope, No. 100. Catheter, case of 6, complete, each 1. 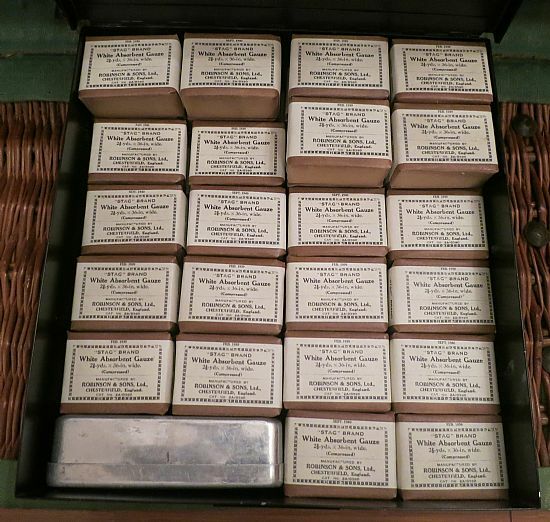 Dressing, Elastic, adhesive, set in tin, complete set 1. Gauze, absorbent, compressed, 36 in. x 2½ yd. each 24. Jaconet, width 44 in. yd. 2. Lint, Absorbent, 4 oz. each 4. Methylated Spirit (Acetone free), pint 1. Methylated Spirit, Industrial grade 2, pint 1. Plaster, Adhesive, zinc oxide, 1in. x 5 sealed tin each 3. Plaster, Adhesive, zinc oxide, 3 in. x 5 yd. sealed tin each 1. Pliers, Wire cutting (for Cramer splinting) each 1. Scissors, Stretcher bearer, pair 1. Splinting, Wire, Cramer 60cm. x 8 cm. each 10. Sterilizer, Fish Kettle, 10 x 4 x 2½ in., complete each 1. Wool, Cotton absorbent, compressed, 2 oz. each 24. *Not stored with assembled equipment. To be obtained and included by the unit. Above: Contents of Tin "A". Bottle, Drop, chloroform, 3 oz. In leather covered case each 1. Measure, Glass, graduated, 1 drachm in minims, in case , each 1. Pin, Safety, straight, assorted, 36s, tin 1. Shade, Eye, single, each 12. Suture, Catgut, sterile, 30 in, size 1, tube 6. Suture, Catgut, sterile, 30 in, size 2, tube 6. Tablet (Oral), Sodium Bicarbonate, 10 grains, each 500. Tablet (Oral), Sulphaguanidine, 0.5 gram, each 500. Tape, Measuring, linen, 5ft, each 1. Tubing, Drainage, red rubber, size 14, yd.1. Tumbler, Medicine, glass, graduated, 2 oz. in case, each 1. Above: Contents of Tin "B". Auriscope, electric, in case (without batteries), complete, each 1. Bottle, Drop, liquid paraffin, 1 oz. each 1. Brush, Nail, Ward, each 1. 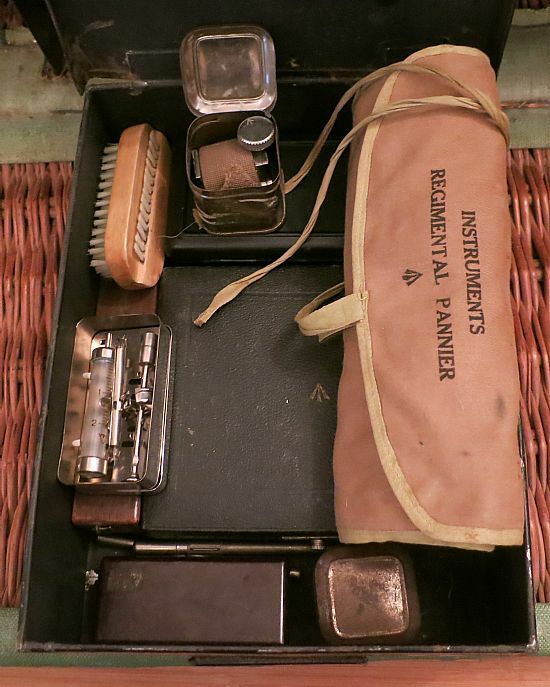 Case, Hypodermic, 1942 pattern, complete, each 1. Needle, Hypodermic, 1⅜ x 21 SWG, BSS fitting, each 6. Razor, Safety, Holder, No. 1. Razor, Safety, Blade, No. 3. Syringe, Hypodermic, BSS.1263 fitting, 5 ml. E.N. each 1. Syringe, I.R. (India Rubber), adaptable, with Eustachian catheter, complete, each 1. Thermometer, Clinical, ½ minute, in case, each 2. Above: Contents of Tin "C". Chloroform, 2 oz. hermetically sealed tube, each 4. Cream, Dibromopropamidine isethionate, 4 oz. tube, each 2. Gentian Violet Compound jelly, 5 oz. tube, each 1. Injection, Morphine, 1½ fl. oz. in 2 oz. amber bottle, each 1. Injection, Nikethamide, 2ml. ampoule, each 6. Iodine and Potassium Iodide powder, tube, each 20. Oil, Castor, BP, lb 1½. Paraffin, Liquid, BP, fl. oz. 3. Solution, Iodine, Weak, BP, oz. 1½. Solution Tablet, Proflavine, each 100. Solution Tablet, Mercuric Iodide, bottle of 50, bottles 2. Tablet (Oral), Aspirin, 5 grains, each 500. Tablet (Oral), Cough, each, 500. Tablet (Oral), Magnesium Sulphate, 60 grains, Wrapped singly, each 224. Injection, Phenobarbitone Sodium, 220 mg ampoule, with solvent, 1 ml. ampoule, pair 18 . Sulphanilamide, BP, powder, lb. 1. Syringe, Hypodermic, BSS.1263, 2 ml. with 4 needles in spirit tight case, each 1. Tablet (Oral), Barbitone Sodium, 5 grains, each 500. Tablet (Oral), Ipecacuanha and Opium, each 100. Tablet (Oral), Phenobarbitone, 1 grain, each 500. Tablet (Oral), Sodium Salicylate, each 250. Tablet (Oral), Sulphathiazole, 0.5 gram. each 500. 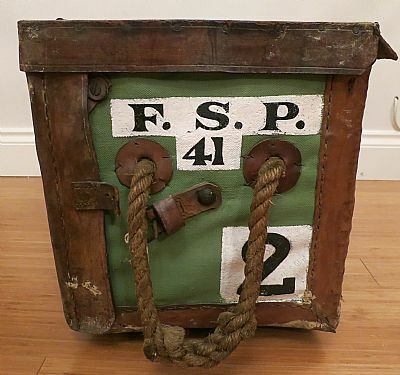 Above: The 1941 Pattern, Field Surgical Pannier No. 2. Above: A photo to show the side markings of the pannier. 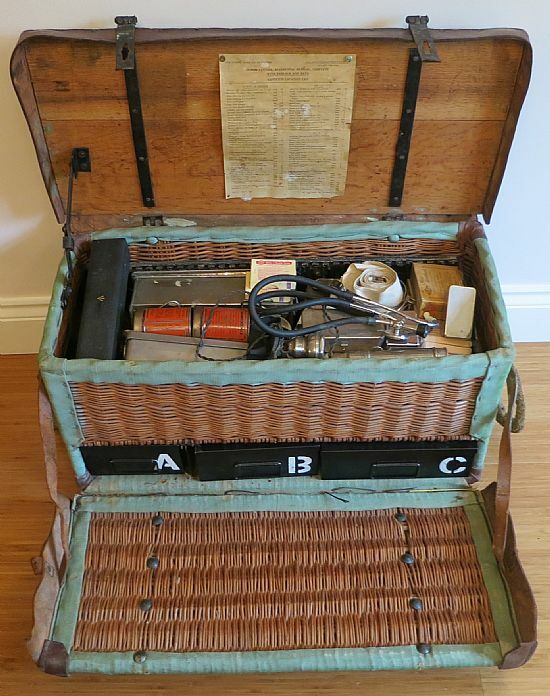 Above: The Pannier with lid and front opened, showing the location of the lower tins (A,B,C ). 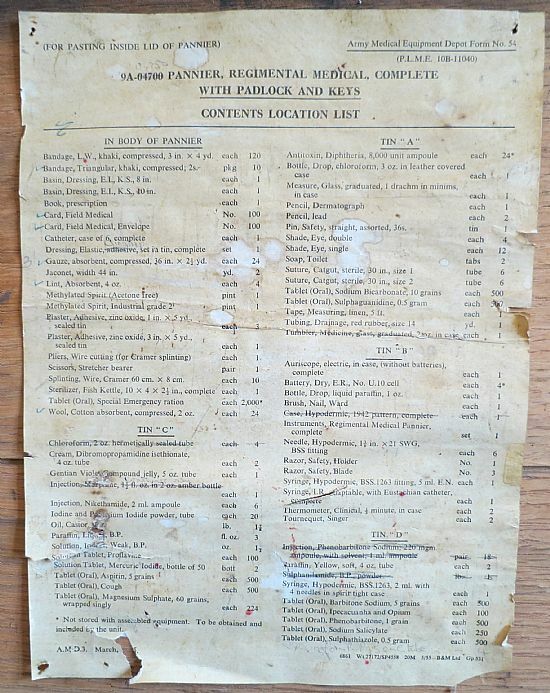 Above: Field Surgical Pannier No.2 contents list and locations. 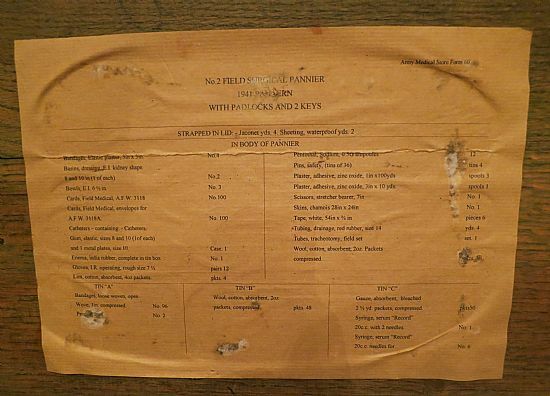 Above: Contents of the main body of the pannier. Bowls, E.I. 6 ½ in. No. 3. 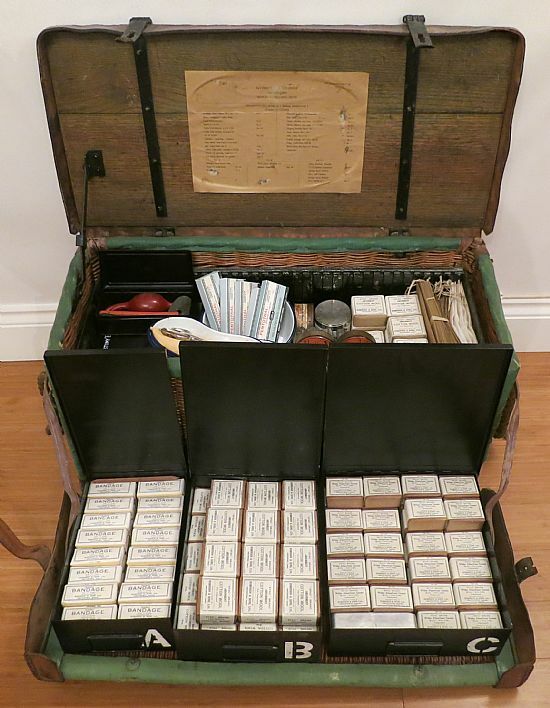 Cards, Field Medical, A.F.W. 3118, No.100. Cards, Field Medical, envelopes for A.F.W. 3118A, No 100. 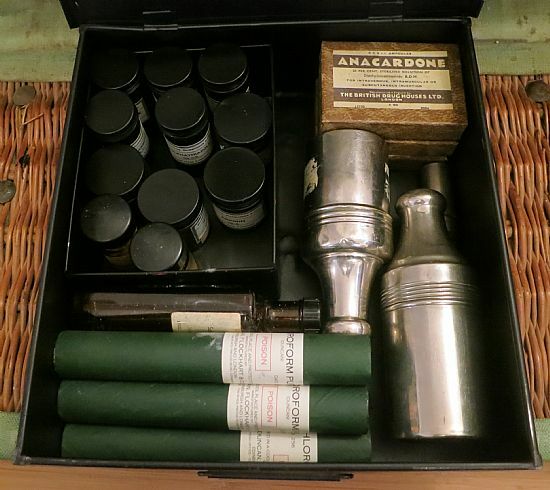 Enema, india rubber, complete in tin box, No. 1. Gloves, I.R. operating, rough size 7 ½, pairs 12. Lint, cotton, absorbent, 4oz packets, pkts. 4. Pentothal, Sodium, 0.5G ampoules, 12. Pins, safety, (tins of 36), tins 4. Plaster, adhesive, zinc oxide, 1in x100yds, spools 3. Plaster, adhesive, zinc oxide, 3in x 10 yds. spools 1. Scissors, stretcher bearer, 7in, No. 1. Skins, chamois 28in x 24in, No. 1. Tape, white, 54in x ¾ in, pieces 6. Tubing, drainage, red rubber, size 14, yds. 4. Tubes, tracheotomy, field set, set. 1. Wool, cotton, absorbent, 2oz. Packets compressed, pkts. 16. Above: The contents of Tin "A". 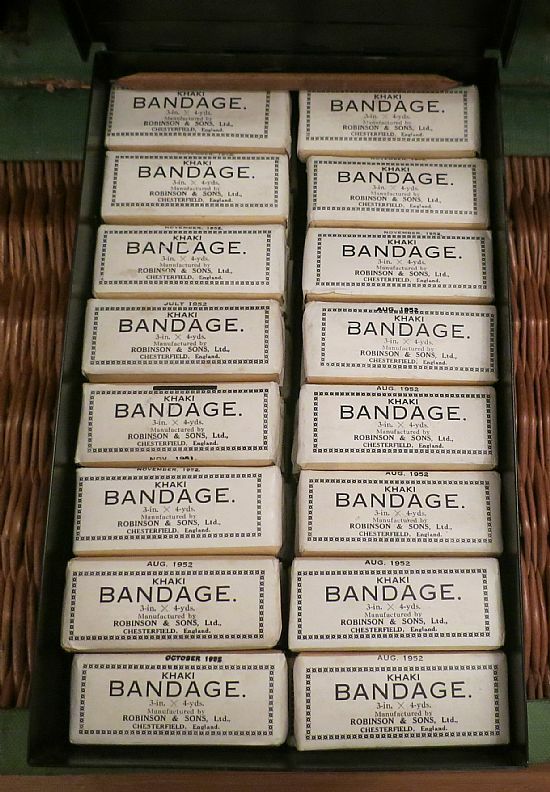 Bandages, loose woven, open wove, 3in. compressed. No. 96. Above: The contents of Tin "B". 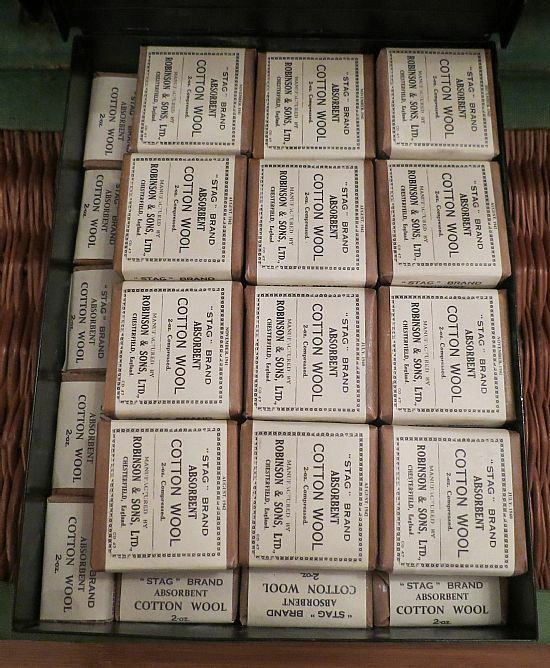 Wool, cotton, absorbent, 2oz packets, compressed. pkts. 48. Above: The contents of Tin "C". Gauze, absorbent, bleached 2 ½ yd. packets, compressed. pkts50. Syringe, serum “Record” 20c.c. with 2 needles. No. 1. Syringe, serum “Record” 20c.c. needles for. No. 6. 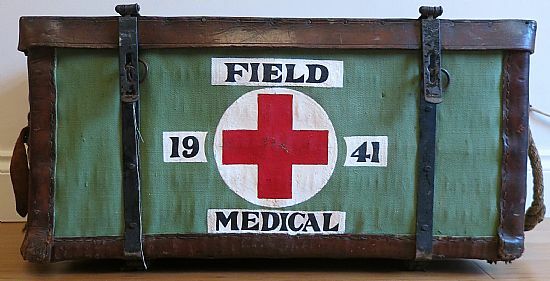 Above: The 1941 Pattern, Field Medical Pannier.